12 Ultimate ½ pint substrate Jars- Pressure sterilized and ready to grow! Holds up to 18 jars at a time! Glossy, full color, easy to follow growing guide with step by step photo instructions. Includes our secret tips, tricks and hints that other grow guides leave out. 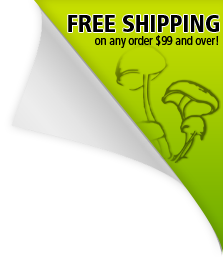 Includes how to incubate, how to fruit, casing methods, and access to our online library of other guides for you to learn even more about how to grow mushrooms! Online and print version included. Start Learning Now! Instant access to our step by step video grow guide is now automatically available to you right after checkout! Midwest Grow Kit's Ultimate Mushroom growing kit is one of our best selling kits! Built for the beginner or the advanced grower looking to save time! This mushroom kit is completely automated! Perfect temperature and humidity are easily achieved for each stage of the process! Setup is a breeze and with 12 of our ultimate jars and room for up to 18, this kit simply out performs any kit in its price range! This mushroom growing kit will be used as an incubator during the first few weeks. This allows for faster colonizing times! This kit will obtain perfect temperature and humidity levels without you ever being around! Complete Automation! Came very fast and is everything I was promised. Packed full of potential. So happy with this product. Comes with everything you need for a beginner or for someone who is more experienced. Even happier with the customer service. UPS dropped my package at the wrong address and was unable to recover it. Contacted customer service and they dealt with it immediately in a professional manner. Couldn't be happier. If you're looking to start or continue growing, this is the product for you. It's excellent quality at a fair price. Purchase it, and you won't be disappointed. Last comment: I recommend this package over the basic growing kit, especially for beginners as it provides a heat source to keep the temperature regulated. I purchased the ultimate growing kit and was super impressed with how complete the kit was, and their customer service is just as good. I mistakenly put a wrong number in the address and when I realized it upon looking at the receipt and sent an email to customer service and they fixed it quickly and everything was deliver with no problems. Package came earlier than expected and was complete based on what was advertised. I inoculated my jars one week ago and have growth in 6/12 of the jars so far. Seems like everything is progressing as it should.